« What’s new in the St. Barth restaurant scene? Continuing my St. Barth restaurant chronicle and recommendations, you must include at least one meal at L’Esprit during your St. Barts vacation. I just love it there. Let me tell you more about the very talented owner/chef. 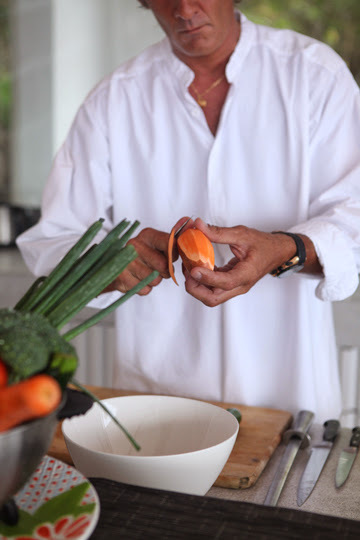 A handsome 6 feet 6 inches in height, Chef Jean-Claude Dufour has an even bigger reputation in the island’s culinary circles. And since the island I am talking about is St. Barth, the gastronomique capital of the Caribbean, well, that’s big indeed. Each time I walk in, I look over to the kitchen which is directly on your right and I see him concocting a right-from-scratch dish for one of his patrons. Some background: Natives of the Bordeaux region of France, Jean-Claude’s family owned a catering business, so he developed a passion for cooking at a young age. He followed his passion, studying gastronomy and working under some of France’s renowned chefs as he came into his own. And then he came to St. Barth. Over the years, his skill and reputation grew, and his dream was to have his own restaurant. In 2011, circumstances were such that that’s exactly what happened. Opening just before New Year’s the now-famous chef acquired the keys to what at one time was one of the island’s popular restaurants, L’Esprit. located in Saline. Jean-Claude donned his toque and quickly began putting his own stamp on things, which included creating a new open kitchen, reconfiguring the space, adding a bar area and crafting an amazing new menu. Included are lots of fresh local fish, interesting dishes with a pan-Asian twist and his signature seared foie gras. 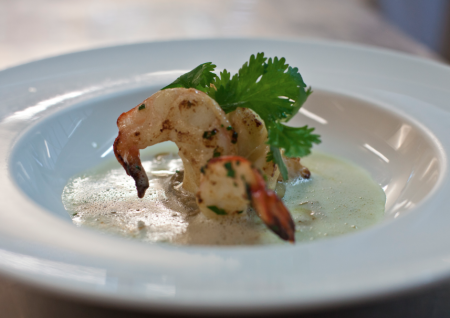 (My favorite appetizer is his Raviole de champignon, gambas plancha (Mushroom ravioli, shrimp cooked on a plancha) – Outstanding! 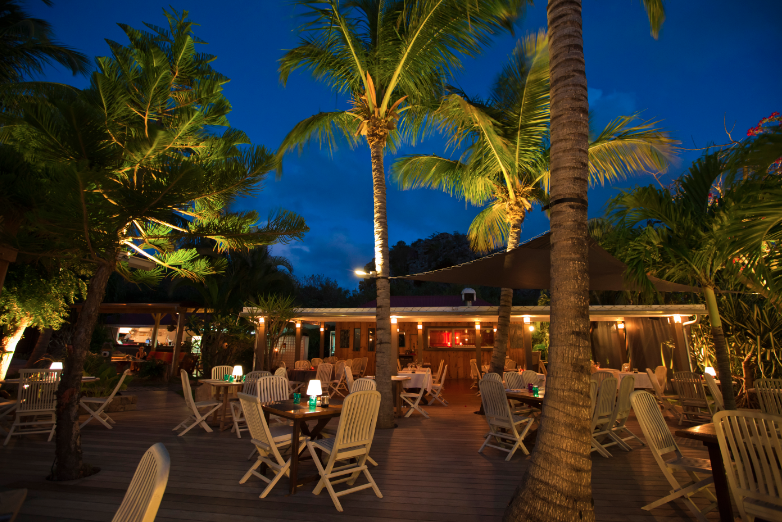 Tucked away in a tropical garden just “down the road” from gorgeous Saline Beach the restaurant offers a décor that is beach-club rustic chic. It seats 90 on the “see and be seen” palm tree-studded teak deck, which is delightfully shaded with canopied pergolas and at more private tables situated on the periphery. So it is really dreamy, especially on a moonlit night. I often get my morning exercise by starting out at Saline Beach and walking right past it. Jean Claude is already busy with his prep and the aromas that emanate from there are out of this world. 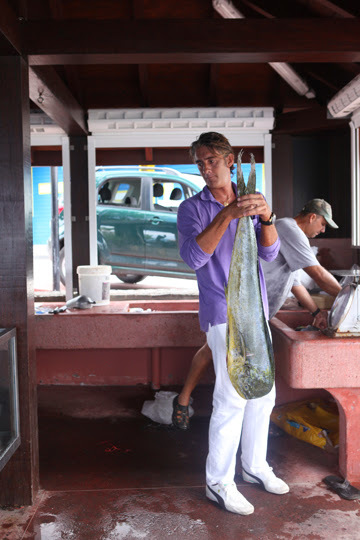 Frequently I will see Jean Claude jumping in his truck to go shopping for fresh fish and fresh ingredients. L’Esprit is also ideal for a long leisurely pre- or post-beach lunch. We’ll vouch for the rosé being chilled to perfection. And there is L’Esprit to Go. During the week, with the exception of Wednesdays, the resto offers a selection of sandwiches and salads, water, soft drinks, wine and beer. They invite you to bring your empty cooler, and the ice is complimentary. Voilà! A beach picnic. I have been treated to his L’Esprit to Go several times while on a snorkeling trip to Colombier with Miguel, The Saint Barth Sailor. All that I can say is that each item was delectable. This entry was posted on Friday, March 21st, 2014 at 2:44 pm	and is filed under St. Barth Restaurants. You can follow any responses to this entry through the RSS 2.0 feed. You can leave a response, or trackback from your own site.